As a French second language teacher, I like to experiment with new pedagogical approaches that engage students in their learning. In my French second language course, some of the hours are given online synchronously and some are given in an active learning classroom. For the past several years I have integrated distance learning in my classes in order to motivate and empower students. This approach that I hone a little each year is efficient and motivating. The students keep asking for more, learn just as well and participate more than in a traditional classroom. With a view to constantly provide courses centered on the learners, I give some of my courses in Dawson’s active learning classrooms (ALC). In the ALC there are several SMART boards, round tables and chairs that can easily be moved for small group activities. 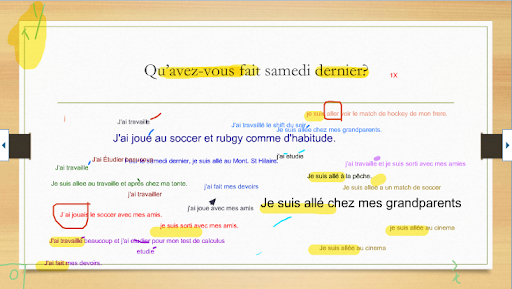 Sample of an activity on an interactive white board in a web conference platform. Speaking is an essential component of all second language classes. The use of these classrooms simplifies the management of speaking activities in small groups. Using the Nureva (Span Technology) interactive boards further fosters the collaboration between the various small groups. It is easy to share the combined screens (canvas) with the students before or after the course to begin or follow up on the work done in class. Moreover, students can post notes on these boards using their smart phones. It’s fascinating! I am only beginning to see all of the potential of these technologies and the pedagogical advantages they offer. Time for the students to become familiar with the web conference platform and the interactive white boards. Even if students have already used videoconferencing in a private setting or SMART boards in high school, they benefit from a session dedicated to learning to leverage the technologies. The technologies become transparent and after a few tries the students manage the boards with ease and help each other (in the target language on top of that!). Increase student motivation which is non negligible for compulsory French courses. Offer flexible learning environment. Students attend classes from any location or on their laptop. Eliminate the effect of isolation associated with certain types of asynchronous courses because the interaction between the teacher and students happens in real time. Provide immediate feedback on student progress as well as immediate response to errors and difficulties. Teachers can explain again on the spot without waiting for the next class. 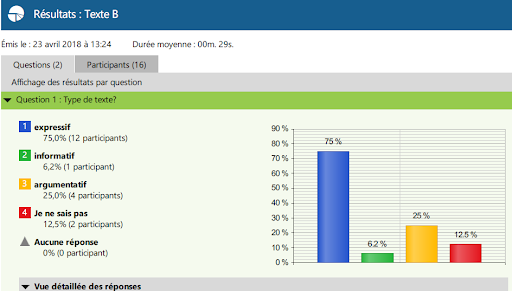 Grasp at a glance the students’ understanding of a notion thanks to surveys that provide immediate feedback as well as individual and group statistics. Foster collaboration in a large group, which is sometimes difficult to achieve in a classroom where only 3 or 4 outgoing students participate. Post interactive documents (PowerPoint, WORD or others). Allow students to adjust size of fonts, the volume and other parameters according to their preferences. Reduce the level of anxiety for those students who say they are less afraid of being judged when they express themselves online in their second language rather than in class. Prepare students for online training they will follow at university or during their career. Active learning classrooms increase the level of motivation. Students say that they learn better while standing and moving around than they learn sitting for a lecture. The room layout is designed to facilitate discussions in small groups, collaboration and face-to-face support. The Span technology allows for an easy sharing of the small group productions with the entire class. Some students would never dare speak in front of a large group of people in class and especially not in their second language. 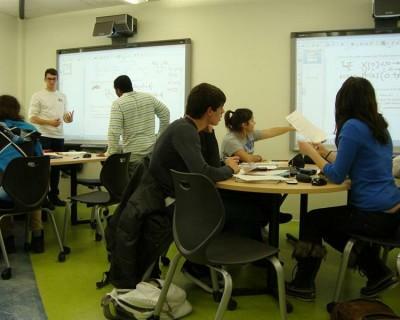 In the active learning classroom those students feel more at ease to interact. The layout of an active learning classroom is designed to facilitate discussions in small groups, collaboration and face-to-face support. Accept that the first version of the course will not be perfect. In other words allow yourself to try new teaching methods that will improve with practice. Proceed by steps, one lesson at a time. The course does not have to be entirely online or entirely in an active learning setting the first time. Foster student collaboration so that they support and learn from each other. Ask students for their point of view on the course in order to improve at each session. Offer students a lot of support and guidance. Request technical support if necessary. Propose various learning activities to meet the needs of different types of learners. Plan active and interactive lessons in both learning environments. Create safe learning environments (safe space) where students feel comfortable to communicate. In the next few years, I would like to delve further into inclusion and accessibility for this type of course. I encourage all teachers, right at the beginning of the design process, to consider the accessibility of the learning material and to plan for various evaluation options no matter which course model they wish to develop. Thus teachers will respect individual learning differences while saving time in the design process. Please do not hesitate to send me your questions or comments. This content was presented at the 2018 SALTISE Conference.